Specification: Wi-Fi Network: 2.4G Hz Working current: Max 10AWorking voltage: AV120V (50/60Hz)Max power: 1250WMaterial: ABS flame retardant polymer Power Consuming: USB Power Output: Max 2.4AWhat should we pay attention to1.This Smart Surge Protector supports 2.4G Wi-Fi network only. 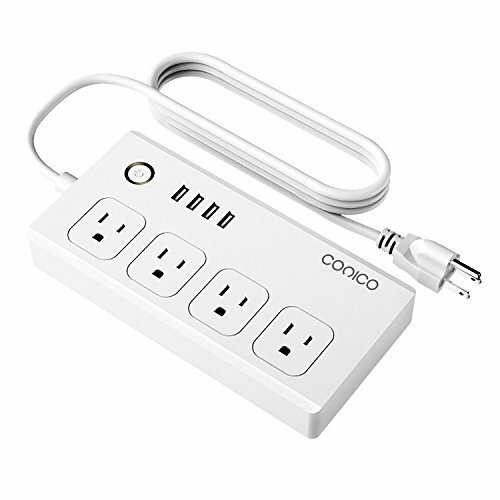 Please connect your 2.4g home wifi network before connect this usb power strip.2.The app compatible with Android 4.1 or higher iOS 8.0 or higher.3.Please do not connect too any household appliances over 1250W.4.If you have any questions, please contact our customer service via amazon message. What's in the Package1x Conico Wi-Fi Power Strip1x User manual.